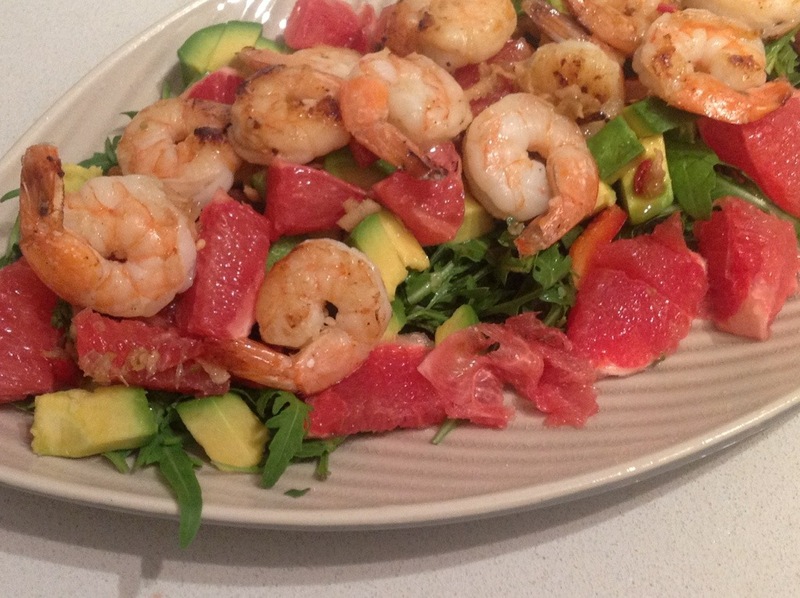 Delicious low fat Prawn, Avocado and Grapefruit salad. This salad is surprisingly fresh, zesty and delicious!! Even my boyfriend who isn’t a fan of grapefruit loved it! The colours and flavours of this salad are fresh and exciting and not only does it taste great it just makes you feel good too! I have been once again trying to eat clean and healthily but have been trying to find a little more inspiration with some knockout flavours to get out of my bland healthy food rut and this did the trick!! Eating healthy should be exciting because there are so many fresh yummy flavours out there but often I get myself in a bit of a rut where I am chomping on rabbit food and not enjoying it, it’s almost a chore.. It shouldn’t be this way !! on a base of rocket with a thai style dressing of lime juice, fish sauce, palm sugar, soy sauce and chilli.